In my 10 part series of posts on the new vSphere 5.1 Storage Features, I called out in part 3 that there was now even greater interoperability between features like Profile Driven Storage and vCloud Director. The purpose of this blog is to highlight this particular interoperability in even more detail. Let’s take it from the top – in my vSphere environment, I built out two datastore clusters, each with 3 datastores. Each datastore in its respective datastore cluster has the same storage capability associated with it. This is the only way storage profiles will work with datastore clusters – all datastores in the datastore cluster must have the same capability. CloudDatastoreCluster datastores has the User-defined Storage Capability called Cloud-Store; DatastoreClusterT2 datastores has the User-defined Storage Capability called Cloud-Store-T2. My next step in the vSphere client is two create two separate VM Storage Profiles, each profile containing one of the capabilities. 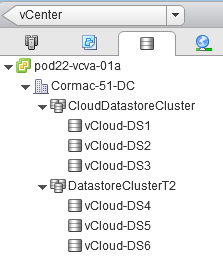 When I create my ProviderVDC, I can now include the datastore clusters (we’ll look at Storage DRS integration with vCloud Director at a later date) and the Storage Profiles. The same is true now for your ORG-VDC; datastores and profiles can now be included at the ORG level. Be sure you assign a reasonable quota to your ORG-VDC or you might bump into this issue. Now when it comes to deploying vApps from the catalog, selecting the appropriate profile will provision the vApp on the datastore or datastore cluster which matches the capabilities defined in the profile. This vApp, win7x64-vApp was deployed with the Cloud-Store-T2 profile selected, which mean that the VM was deployed on a datastore with a matching capability – vCloud-DS6. That in itself is a great feature to have – you no longer need to worry about the specific underlying capabilities of the datastore, you simply select the correct profile and it determines that for you. Some simplified profile naming will make the provisioning of vApps from vCloud Director error free each and every time. In the Virtual Machine’s status window in vCloud Director, we see a status change to Updating. In the vSphere Task Console, we can see a Relocate virtual machine task underway. So all we did was change the profile associated with the VM, and a migration operation is automatically initiated to move the VM to a compatible datastore. This is ideal for situations where an organization may start on a lower tier of storage, but after a while realise that they may need a higher tier (or indeed vice-versa). 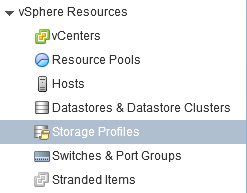 The administrator simply changes the profile, and the VMs are seamlessly migrated to the new storage tier. Can you have disks associated with different storage profiles associated with the same VM? Say, slower boot disk, and fast one for a DB? I’m afraid I don’t see a way to do this, but am willing to be corrected by somone with more vCD smarts than I have. As far as I can see the lowest level of storage profile granularity is at the VM level. So multiple VMs within the same vApp can be placed on different profiles, but I think that is the lowest level you can go to. I wish they would add this. Just wanted to add that there is a very *important* pre-requisite task to have Storage Profiles working in vCloud Director 5.1.0. 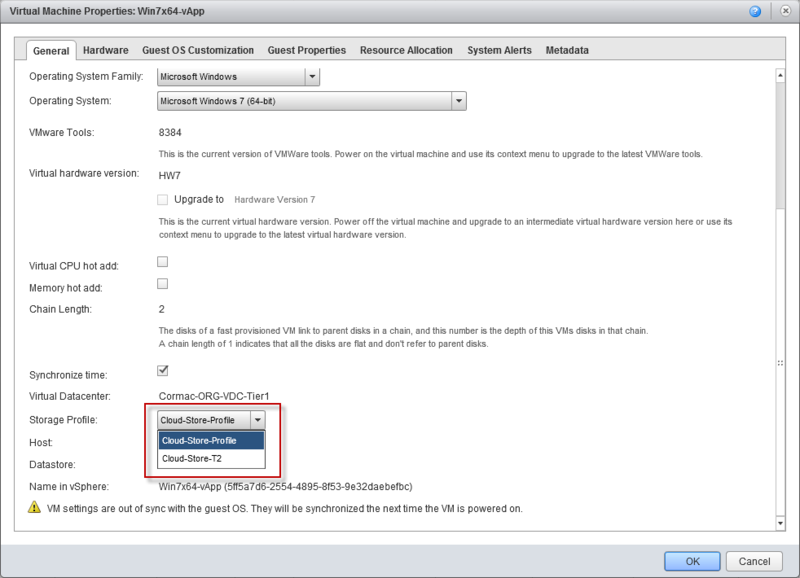 You need to enable the Storage Profiles at the vSphere level on your cluster backing up your Provider vDC. (Not doing so, can lead to very *unexplicit/ambiguous* errors when doing stuff like Catalog Uploading etc. By default a cluster can be in a “Unknown” status mode for the “VM Storage Profile Status”. Thanks Timo – great tip! What is the difference between Data store cluster vs Storage Profiles? as a best practice which one is good for which situations? Completely different features which can complement one another. I’d suggest reading the official documentation to answer your question. I’m trying to find any documentation about how data is spread amonst datastore’s which are member of a storage profile. We currently notice a inproper ballenced data usage in terms of GB in the datastore’s member of a storage profile. Also, what’s the percentage which vcloud stops deploying storage when the datastore’s become almost full. Any idea’s?